As criticism of the dolphin hunt underway in Japan's infamous Taiji continues to mount, Japanese officials have been put on the defensive, releasing a statement calling the capture and slaughter of corralled dolphins "a traditional form of fishing in our country." But while much of the outrage has stemmed from the West, protests over the practice are growing among those most capable of outlawing the brutal hunt -- the Japanese people themselves. Dolphin activist Satoshi Komiyama, in an interview with TakePart, says that the public's knowledge of Taiji's dolphin hunt, which claims the freedom and lives of hundreds of wild dolphins a year, is surprisingly limited -- especially since it's been defended as a national tradition. In fact, outside of Taiji, most Japanese citizens might find the practice as disturbing as those critics abroad. "The majority of Japanese people do not know about the dolphin hunting, so they have no idea about Taiji either," says Komiyama. "But when I tell people about what is happening there, they typically say, 'poor dolphins,' 'unbelievable,' or 'unimaginable.'" According to Komiyama, who's helping to raise awareness of the hunt domestically, many people in Japan aren't exposed to its horrors like many in the international community. "Media in foreign countries are willing to write or air stories about the anti-dolphin hunting movement in Japan, and their information is accurate. But Japanese media is the opposite." Even within Taiji, where citizens are more informed of the harsh realities of the hunting tradition, support for the practice isn't universal. Sakae Hemmi of Elsa Nature Conservancy in Japan, in an interview with Digital Journal, says "not all Taiji people are pro-dolphin hunting, but a very small number of dolphin hunters made their town infamous" through documentaries like "The Cove." While much of the purported purpose of the hunt has been to get dolphin meat for human consumption, studies have found that residence in Taiji who eat it have been exposed to dangerously high levels of mercury as a result. Morality aside, Japan's failure to ban the hunt as a public health issue suggests there's more to preserving it than "tradition" alone. Before its waters were bloodied by the slaughter, among the 250 dolphins driven into Taiji cove last week, dozens of dolphin calves were separated and a super-pod became destined for a life of captivity in Japan's many aquariums and marine parks -- institutions that did not exist but a few decades prior. Hardly traditional. 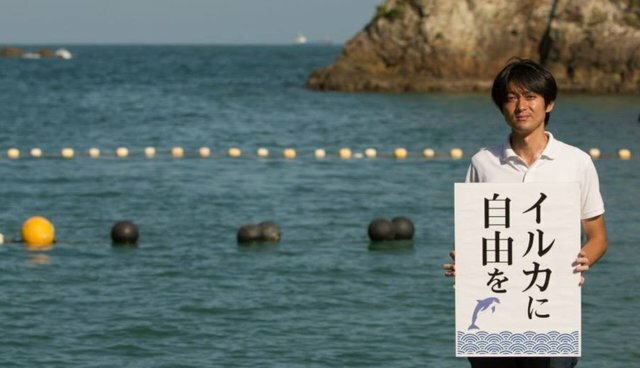 As voices abroad continue to urge that the dolphin hunt cease to exist, a growing number of activists within Japan are keeping the pressure up as well by raising awareness among the electorate -- the single most powerful force for ending a "tradition" of which they've been cast as followers. Read an exclusive account from one citizen of Japan who only heard about the dolphin hunt after moving to the United States.